10 | TH E M R EP O RT TAKE 5 M // What challenges will mortgage professionals face this year? ISHBIA // Obviously the easy answer to tell you is that rates went up since post-election. And so one challenge will be adapting in the purchase environment. But the biggest challenge I would talk about is twofold—the first part is mortgage professionals adapting to the new technologies in the market, and the second pertains to how mortgage professionals acclimate to the market dynamics. As part of this, it is important to understand that the way business was done in the past is not the way it's going to be done in the future. Adaption is key. A lot of times, loan officers are set in their ways. I think what we've seen is a lot of them have evolved and have been thriving in the new technology and sometimes, they have not. A lot of times, loan officers are set in their ways. I think what we've seen is a lot of them have evolved and have been thriving in the new technology and sometimes, they have not. 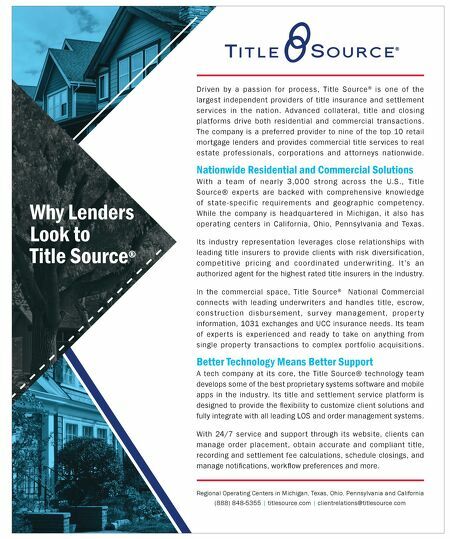 Wholesale lending is becoming a bigger channel and so a lot of the retail people—retail loan officers and people that work at banks—are converting over to brokers because wholesale is starting to really thrive, and people are seeing that there's more options as a loan officer. Over in the broker world, there's better pricing, better products, better everything. That's the other one. M // What will make a loan officer successful in the face of these challenges? ISHBIA // The biggest thing is that loan officers need to be open to change. Are retail loan officers open to working in a mortgage broker shop? There is a lot of opportunity for career growth in the wholesale channel, as they can work with more lenders and have access to more loan options to attract a greater number of clients. Are entrepreneurial-minded loan officers interested in going out on their own and opening their own broker shop? The KickStart program that we gave NAMB [National Association of Mortgage Brokers] $500,000 to help launch grants individual loan officers with up to $10,000 in seed money to start their own independent mortgage business. Another thing is, are loan officers willing and capable of adapting to technology? Change is the biggest challenge for mortgage professionals this year and I'd even say in 2018, as well. M // Speaking of change, in what ways has wholesale lending changed over time? ISHBIA // It's changed so much. About five years ago, it was probably in its biggest dip of all time, from post- crisis to where it was at in 2011 and 2012. It's really been on the upswing since, and it's going to be continuing to thrive. Post-crisis, there was a lot of uncertainty in the industry. There were new regulations introduced that people thought were going to hurt mortgage brokers. So everyone went running for cover to originate loans for banks and retail lenders. Wholesale lending has changed over the last five years or so, from people not knowing what was going to happen to mortgage brokers to, all of a sudden, those loan officers who switched to retail are looking around and seeing that brokers are still thriving. Today, lenders in the wholesale space are taking on more of a leadership approach to helping brokers grow their business – things like marketing, compliance and technology. Wholesale lenders are essentially doing everything that retail branches do, but loan officers at broker shops aren't captive to just one. They have the ability to shop around and find lenders with the best pricing and service for each client. M // How do you predict 2017 will stack up compared to last year? ISHBIA // At UWM, we did $23 billion last year. We're going to do more business in 2017 than we did in 2016, and that's not going to be the common trend. The credit for that doesn't just go to us, but also to our brokers, who are doing a great job and are also going to do more business. A lot of lenders that will see less business in 2017 than they did last year are the ones that were focused exclusively on the refi, or focused on servicer-to-servicer refinances. Those loans are a lot less likely to be refinanced because people have a lower rate on their loan than they can actually get today. I think you'll also see a lot of mortgage brokers do more business in 2017. The purchase market will be a huge percentage of the business and, if lenders didn't adapt and change with the market, they'll get left behind. M // What about looking five years ahead? What can we expect from the wholesale mortgage industry at that point? ISHBIA // The next five years are going to see even more change, where I think the broker market won't get back to the 50 percent it used to be, but it'll go back up to 20 percent or higher in 2020, 2022, based on all these changes. Mat Ishbia, President and CEO of United Wholesale Mortgage, spoke with MReport on how mortgage lenders and brokers can adapt to the changing climate. According to Ishbia, the industry is not in the same place it was just five years ago, and drastic changes are sure to continue into the coming years. Ishbia takes us through how wholesale mortgages changed, and what can we expect in the future. 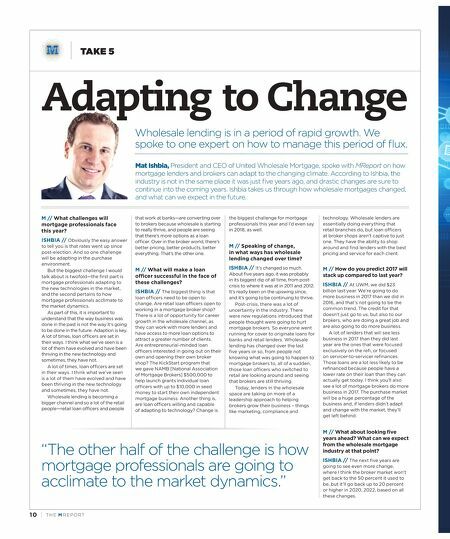 Adapting to Change Wholesale lending is in a period of rapid growth. We spoke to one expert on how to manage this period of flux. "The other half of the challenge is how mortgage professionals are going to acclimate to the market dynamics."